Description: SCP-2492 is a bedside desk lamp measuring 370mm in height and 100mm in diameter. SCP-2492’s anomalous properties will activate when it is plugged into a standard BS-1363 wall socket, switched on, and a single child between the age of eight and nine falls asleep within the same room as SCP-2492. Once this has occurred, several minutes after the child has fallen asleep, SCP-2492-1 will manifest within close proximity of SCP-2492. Switching off SCP-2492 will prevent SCP-2492-1 from appearing until it is turned on again. SCP-2492-1 is a predominantly incorporeal entity resembling a disembodied right humanoid arm, with a maroon skin tone and severe bruising, scarring and several missing nails. SCP-2492-1 has shown that it is capable of touching and feeling, often grasping various furniture and other objects in its surroundings. SCP-2492-1 is capable of altering its own length by extending further from its manifestation point and shortening itself back towards it. When manifesting, SCP-2492-1 will first appear as if reaching towards the light emitted from SCP-2492, and then begin feeling around the room until locating the child present. Upon locating the child, SCP-2492-1 will move towards their head and begin feeling their facial features in great detail. SCP-2492-1 will then spend a varying amounts of time interacting with the child in a variety of ways, such as stroking its fingers through the child's hair, resting its hand on them and brushing its hand against their cheek. After a varying period of time, it will move towards SCP-2492 and switch it off before retreating back to its origin point and vanishing. Children SCP-2492-1 has interacted with have shown no signs of distress or discomfort when touched by SCP-2492-1. Children will not awaken in the presence of SCP-2492-1 unless provoked by an outside source. SCP-2492-1 will often show signs of awareness if the child awakens, often expressed through a sudden jolting of its fingers before retreating back to its manifestation point and vanishing. SCP-2492 was originally located in ██████, England in the house of Patrick ███████, after reports of an intruder infiltrating the premises and later being found deceased. Police reports show that the criminal had apparently broken into the house at night, and shortly after entered the room of Patrick ███████’s son, Gregory ███████ for unknown purposes. Interviews with Gregory ███████ revealed that the intruder had apparently been grabbed by what he described as a ‘floating hand’ before killing them via strangulation, and then moving towards his bedside lamp before switching it off. When interviewed, Patrick ███████ claimed that he had found the lamp while searching a spare room in his house several weeks after moving in on ██/██/2014, and had given it to his son to use. 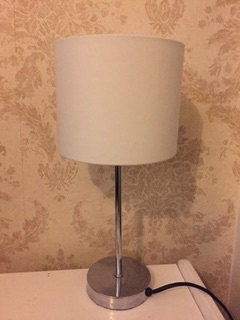 The bedside lamp was later taken into Foundation custody and reclassified as SCP-2492. Investigation into previous owners of the house containing SCP-2492 revealed it to have originally been purchased by the houses previous owners, Thomas █████████ and Margret █████████ (deceased, traffic collision). SCP-2492 had apparently been used by the couples' son, Milo █████████ as a bedside lamp. Thomas █████████ claimed that they had forgotten to bring SCP-2492 along with them when moving, as well as several other items which proved to be non-anomalous upon investigation. Addendum 2492-1: SCP-2492-1's physical state has begun showing increasing signs of damage with each manifestation, barring greater levels of scarring, bruising and has began to show signs of second degree burns. These injuries do not seem to heal over time. SCP-2492-1 has shown increasing signs of discomfort, often trembling while moving and when pressure is applied to its injuries from objects it interacts with. Scarring and burns appear to form on SCP-2492-1 as it emerges from its manifestation point, which may imply the act of manifesting itself to be responsible for its injuries. Despite these factors, SCP-2492-1 continues to manifest with each activation of SCP-2492, and continues its standard behavior despite its continued signs of physical distress. Testing of SCP-2492 has also shown there to be a recurring change in SCP-2492-1’s behavior when it interacts with children who share a distinct set of shaped facial features with one another, all of which appear to match that of Milo █████████'s (Details described in Document 2492-A). This change in behavior is expressed through SCP-2492-1 suddenly and frantically feeling various parts of the child's face, after identifying a facial feature similarly shaped as described in Document 2492-A. Due to the age range of children which activate SCP-2492’s anomalous effects and the current age of Milo █████████ exceeding this limit, the finding of children with almost identical facial features to Milo █████████ for use in testing has been approved. Addendum 2492-2: On ██/██/████, a child with almost identical facial features to Milo █████████'s was presented to SCP-2492. At this point in time, SCP-2492-1’s physical shape had worsened to the point of having significantly more bruising and scarring than previously recorded, and showed signs of intense pain when making contact with the subject. After inspecting the subject's facial features for several seconds, SCP-2492-1 appeared to pause and repeat this process several times for the next few minutes. Afterwards, SCP-2492-1 remained still for several seconds while appearing to shake intensely. SCP-2492-1 then wrapped its arm around the subject's head tightly and began stroking their cheek. Despite its condition, SCP-2492-1 continued this for approximately five hours, trembling while doing so. SCP-2492-1 retreated back to its origin point after the incident, appearing less agitated than previously. SCP-2492-1 has not reappeared since the previously mentioned test. SCP-2492 will no longer switch on despite all attempted efforts.